YACHTmegleren AS offer this amazing ship for sale at 8.500.000 Euro, located in Oslo during the winter, and cruising along the Norwegian cost in the summer. Launched in Holland in 2004 and designed in the elegant style of the early passenger vessels, the 48 metre (158′) steel and aluminium GRACE is definitely a Gentleman’s yacht. However, there is nothing old-fashioned about this vessel! Her classic exterior lines and traditional detailing are skilfully combined with all the modern systems required for safe, economical, comfortable and efficient operation. Her hull is strengthened to Ice Class standards and its efficient hydrodynamics provide transatlantic range at low fuel cost making her eminently suitable for worldwide expeditions at both high and low latitudes. 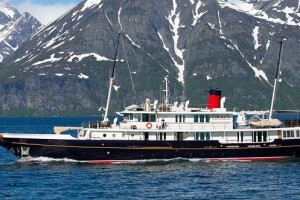 Grace is a 48 M steel and aluminium elegant explorer vessel of classic design under Dutch flag. She is certified for unlimited commercial navigation with Ice Class. Grace accommodates 10 passengers and 7-9 crew in comfort. Her class is Netherlands Shipping Inspection & Bureau Veritas. She is commissioned in 2004 and is in ‘as new’ condition. The hull and superstructure are smooth and fair, and almost no “cosmetic” filler has been used. Her strengthened hull, propellers and rudders allow certified operation through ice of up to 40 cm. She has all the modern electronics, technical systems and safety equipment required for safe operation, but her lines are resolutely traditional. Teak decks, bronze railings, deck fittings and lights recall the golden age of travel by sea. “Grace” aims for high quality and lasting value without being in any way ostentatious. Her timeless styling and elegance will never become outdated, even 100 years from now. A maximum speed of 12.5knots can be reached with a range of more than 5300 nm at 10 knots. Classification Bureau Veritas I 3/3 (E) + Special Service Charter Yacht, Deep Sea Ice Class III, MACH. Sales Tax Status Commercially registered (therefore VAT not paid). Guests 2 x double guest cabins with ensuite shower rooms situated aft on the lower deck. 2 x twin guest cabins with ensuite shower rooms on the lower deck. Crew Accommodation for Captain plus six crew (plus 2 pullman berths) in 5 cabins. Fuel Consumption at Economical Speed 85 Litres 22 US Gallons per hour. This ship is in mint condition, present better than new, inspected of Yachtmegleren febr. 2015. Please contact the Yachtbroker Stian Sandlie +47 92467000 for more information or if you want to see the ship. Dont hesitate to take contact if you want to do a great deal on one of the most amazing ship in the world. Perfect and ready for new adventures. Keen seller! Air Conditioning/heating Marine Air 4 stage chilled water air conditioning. ACV/Elco 140 kw air and radiator heating throughout. Other: Stento/Racal batteryless emergency telephone system. Cummins NT855 14l. 6 cyl.